I'm gobbling, gulping and forking down this book page by glorious page. I think Julia and I would have been dear friends. Who knew she didn't know a lick about cooking before she went to Paris?! Who knew she was 6'2" tall?! Who knew she had such a fun, strong personality?! Well, now I know. 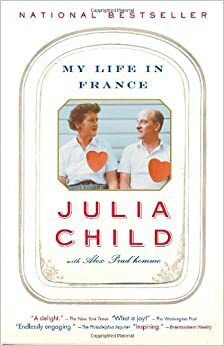 "The sight of Julie in Front of her stove full of boiling, frying and simmering foods has the same fascination for me as watching a kettle-drummer at the Symphony... Imagine this in your mind's eye: Julie, with a blue denim apron on, a dish towel stuck under her belt, a spoon in each hand, stirring two pots at the same time. Warning bells are sounding off like signals from the podium, and a garlic-flavored steam fills the air with an odoriferous leitmotif. The oven door opens and shuts so fast you hardly notice the deft thrust of a spoon as she dips into a casserole and up to her mouth for a taste-check like a perfectly timed double-beat on the drums. She stands there surrounded by a battery of instruments with an air of authority and confidence..."
Basically I say get up, get out the door, get this book and get to gobbling it up. All of it. Right now. And if you'll excuse me, I have a bit of reading to get back to. My mom liked this as well. I will have to get it.